Micro-switches are often found in arcade buttons and joysticks but they’re also really handy in any kind of mechatronics project or when you need a basic sensor. They are always ‘tactile’ (clicky feeling), and ‘momentary’ (the switch closes when pressed, then snaps open once released). They come in a few different varieties (mostly having to do with the contacts and how big the actuator is). 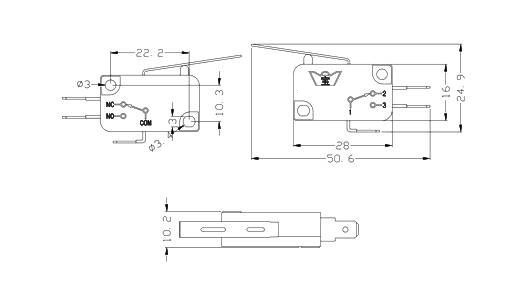 This microswitch has a flat metal lever actuator and two terminals. Normally they are not connected, when actuated they short together. We also have kinds with a bump actuator, roller lever and long wire. This is a basic micro switch and we don’t have any detailed specifications for it other than it can switch up to 3 Amps at up to 250VAC. Sugru — Black and White Pack	774 грн. Maxbotix Ultrasonic Rangefinder — LV-EZ4 — LV-EZ4	960 грн. Digital Multimeter — Model 9205B+	814 грн.